McComas is a leading researcher in heliophysics, which is the study of the Sun and its interactions with the Earth, the solar system, and interstellar space. The heliosphere is a giant bubble inflated by the solar wind and extending far beyond the orbit of Pluto. McComas is the principal investigator of NASA’s Interstellar Boundary Explorer (IBEX) mission, which is mapping the interactions between the solar wind and the interstellar medium at the edge of our solar system. McComas is also the principal investigator of NASA’s Two Wide-angle Imaging Neutral Spectrometer (TWINS) mission and scientific instruments onboard the Ulysses, Advanced Composition Explorer, New Horizons, Juno, and Solar Probe Plus missions. Data from his instrument on New Horizons just revealed that Pluto has a giant tail of heavy charged particles, as its nitrogen-based atmosphere stretches out behind the planet. McComas served on the NASA Advisory Council’s Science Committee from 2010-13 and served as Chairman of that Committee and directly on the NASA Advisory Council from 2013-15. He was a primary developer of the graduate program in physics, jointly sponsored by SwRI and The University of Texas at San Antonio, and serves as an adjoint professor. He received the COSPAR (Committee on Space Research) Space Science Award in 2014 and the American Geophysical Union’s James B. Macelwane Medal in 1993. 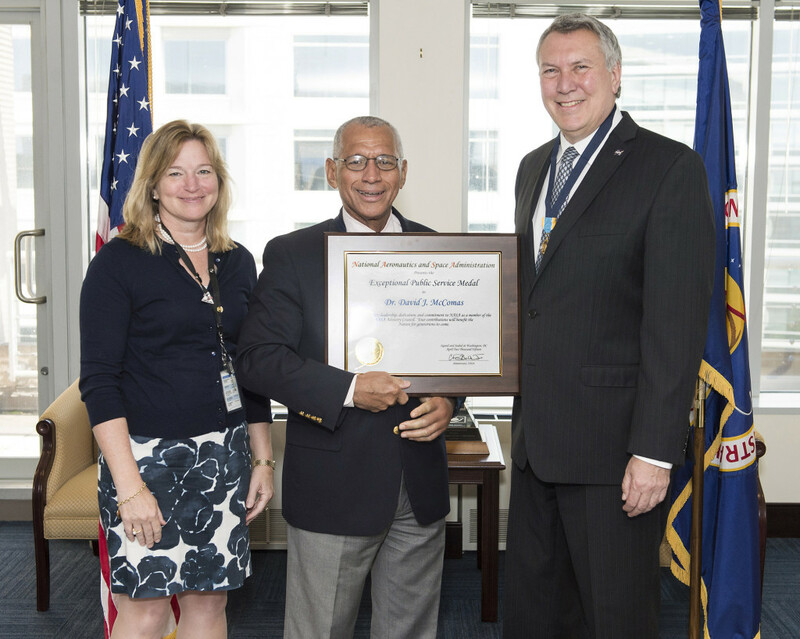 McComas also has received numerous NASA and European Space Agency group achievement awards. He has published over 500 scientific papers that collectively have been cited over 19,000 times and is a Fellow of the American Physical Society, the American Geophysical Union, and the American Association for the Advancement of Science.